My "Panache" is a plastic eagle which probably began life at the top of a small flag pole. It is a road find. It is held on to my new Giro helmet by a plastic zip tie. A person with a sense of humor. Somebody who doesn't take himself too seriously. I believe that Igor conveys these attitudes as well as any clothing accessory could. 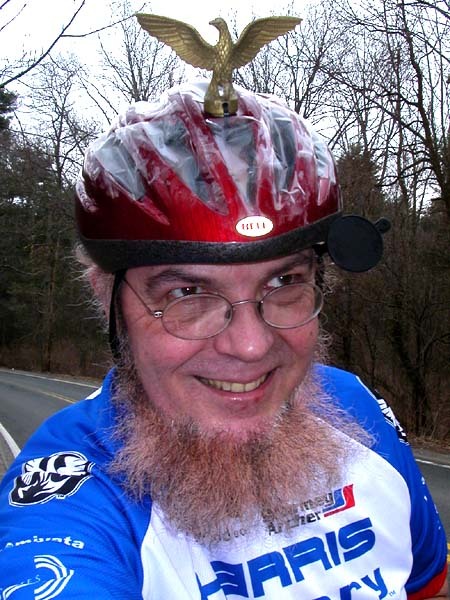 As you can see by the snow on the road and in my beard, this was a cold winter's commute. One of my ways of dealing with cold weather is to cover my helmet's ventilation holes with tape. This really helps a lot, and I highly recommend the tape trick for winter cycling. The helmet itself is an early Bell Image, which I painted red because that's my favorite color. While I am not generally fond of displaying corporate logos on myself, I have a high regard for Bell, so after I painted the helmet I put a new Bell sticker on it...but I used a teeny-weeny one that came with a model car kit somebody gave my son. You can just barely see the oval in the photo, but can't make out the logo at 72 dpi. See also my page about Hats, if you don't have anything better to do!